Dear Francy: Mother will not use her cane…she falls…I know because she has bruises – but her pride is over the moon and she will not use them. She is also having night problems with her bladder…I have to change the bed each time I visit…but no mention of it from her. How can I get over this pride issue and keep her safe and clean and feeling good about herself? TALK ! There comes a time when seniors have to sit down and listen to their children. It is a hard thing for both fathers and mothers to do- but the transition from being their ‘little girl’ to their care giver simply has to happen. I get it. I have talked about medical equipment and how to acquire it and when to use it before…but just when I think everyone knows…I get four emails in a row about problems with seniors and a need for help. So, I am going to review the different things you need to use as a senior progresses in their life’s journey. Use a gel cushion in the car and on your favorite TV chair…save that bottom and your back…it feels great! Start with a gel cushion: When you age, your bottom and your feet start to change and you need to use a little gel cushioning. I am in my early sixties and I have both gel in soles in my shoes and a get cushion on my bottom when I rest…I am a happy girl…get one and enjoy pain free life again! Age and how a senior feels and their personal challenges are always different. That is why its good to know what is out there for you to help anyone that has ups and downs in their health. Heart problems can come and go and so can arthritis–so if you have some of these helpful tools on hand. You can use them when needed. To carry this idea out…we need to talk about a commode. These are like portable toilets. When a man is up 2-3-4-5 times a night with prostate issues…or when Parkinson’s has you extremely unsteady…a portable toilet, called a commode, is the ticket to ease of use and relaxed worries of accidents and falls. This commode has a bucket you fill with a bit of water and I hit it with a small amount of Pinesol type product. Then you keep it by the bed…so it is just a few feet away. I put a plastic sheet (black bag) down under it and have toilet paper ready. It is used at night..then during the day you take out the bucket and dump it in the toilet and put the unit over the toilet in the bathroom so the senior can use it with it’s handles for sturdy up and downs. REMEMBER:You always have to ask your doctor for the different products to help you. The doctor will write a prescription for the item and the medical rental house will get your product ready and it will then be able to be all or partially covered by Medicare/Supplement. If you are lucky, like we are, and have Veteran’s…they will give you a review and provide the equipment. If you do not have coverage and need medical products…then it’s time to check out local charities and ask them for help. They often are giving things after someone passes. They clean it up and get it ready for you to use without a big investment. Be creative…do not be embarrassed to ask for help from friends and local charities…they are working hard to provide things for your use…use them. –> NOTE:Women need to use pad or pants that are designed for urinary problems. Not pads for menstruation. This is very important because the wrong pad for the wrong situation can lead to nasty UrinaryTrackInfections. UTI’s are one the main health risks of both men and women when they begin to lose their strength. 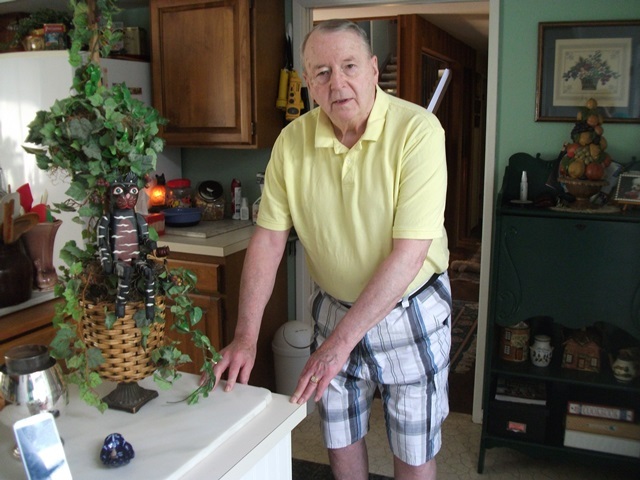 UTI’s can take a senior down and change their future living alone abilities… in no time. We can not stress enough to “talk” to your senior about their bathroom issues. Then talk to the doctor. Stool problems can lead to real problems; and the use of stool softeners and/or Imodium products to harden stools can reduce those terrible battles in the bathroom.Medications has nasty side effects for all of us…but especially seniors find them embarrassing and often to do not mention the problems. Men have to relax and let a pad or “Depend” under short type product reduce their need to hurry to the bathroom everywhere they go. Doctors can and will give you a prescription for urinary pills that will reduce the ‘urge’ feeling that requires so many bathroom visits. This ‘hurry up’ is the cause of many seniors falling in the middle of the night. A good mattress cover is required. Most seniors need to update their bedding after years of use anyway. So, get a new mattress cover that will protect the mattress and give a little cushion to the older bed. Add two new sets of easy to wash sheets and pillow cases so they can be easily washed and changed. Most seniors like the feel of flannel sheets almost all year round…so keep that in mind when you are buying the new bedding. Update the pillows so the senior has two new pillows for head. Use the older pillows and put one for between their legs to cushion the legs and one to tuck under their upper arm to put them into a womb-curling posture as they sleep. This wrapping them in comfort will allow them to sleep soundly. Adding a night-pad or Depends type of pant…will let them know they are OK, if they have an accident. Then adding in the commode or toilet handles will be a winning ticket for seniors with night time worries and accidents. —-> Tip//how a lady wipes her bottom after a bowel movement — is going to stop a lot of UTI infections. I had mother re-learn this process…she also used a femine wipe..or child’s diaper cleaning wipe and put it into the special (with swinging lid) trash bin…not down the toilet. These products will clog your sewer system! So teach them to have a trash bin close to the toilet to use for the wipes and a place to put their Depends type products. Then you line the trash bin with a light plastic liner and empty it twice a week to keep the smell out of the bathroom. I use a disinfectant spray inside the trash bin and then re-line it with another tall plastic bin bag. (I get mine at the dollar store) This makes this whole process easy for the senior and the care giver to use and keep really clean. I also have a container of cleaner-wipes (w bleach) under the sink and I use them to wipe off the toilet area and the sink and other handles and light switches- each time I clean the bathroom. This keeps down the germs and the odor. Seniors often lose their sense of smell so you have to help them keeping clean. I have never been so proud that I could not use a cane with my back. I have had a bad back long before I became a senior. The pain was too much to worry about pride. Even as a younger woman, I had a cane hanging in the closet. It helped me through the three days of pain until the back would relax and let me go back to my regular walking. Cane and Handle helps George w balance. Just as you prep your house for little children or dogs…its time to do it for seniors that will be aging into health challenges. The senior may only need a few of these items as they move downhill in their health. But actually, at the first signs of stability problems, its time to make changes. Stair lifts are such a lovely thing for those that can afford them. They allow the senior to stay in their two story home, so much longer. And electric chairs are great too. But they are for seniors that have all their thought processes working. Since my George suffers with his Alzheimer’s and Parkinson’s he is unable to remember how to use the electric chair or cart. George started using his walker quite a while ago. But it only worked as a walker. It did have a seat for him to use when he got tired…but now he has days that he is too weak to walk at all. So, what to do? We asked for a Physical Therapy appointment and the PT gave us a very small, light weight, wheel chair with small wheels. 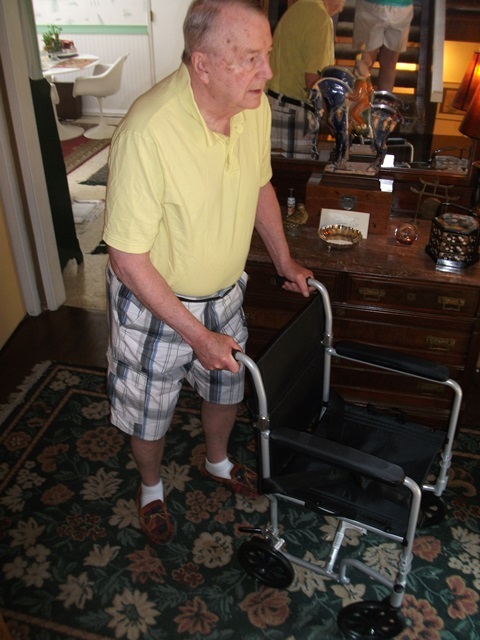 It now is used as a walker for George when he is feeling strong. 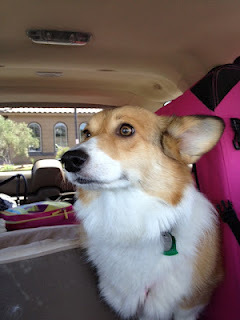 The chair is light and easy for me to fold and put into my smaller car. (not everyone uses an SUV) and it works well when George walks. I am going to look around for a larger bag that can hang off the back of the chair so he can grab a few things to take from room to room. I also have to figure out how he can have his cane on the back of it too…so maybe a velcro connection there?? Walking w his legs instead of me pushing is Great! The new wheelchair also allows him to sit and walk with his own legs. The older walker was not designed for this move. Now, George is able to move around on his own with his own leg power, without me pushing him all the time. NICE – he is able to walk it out to the front porch where we have a container garden and he helps me water the tomatoes and catches some sun rays each morning. Now what do you do when you wake up and your spouse is not able to even get out of bed to begin their day? You learn how to use a ‘gait belt’ – the Physical Therapist will show you how to use this. 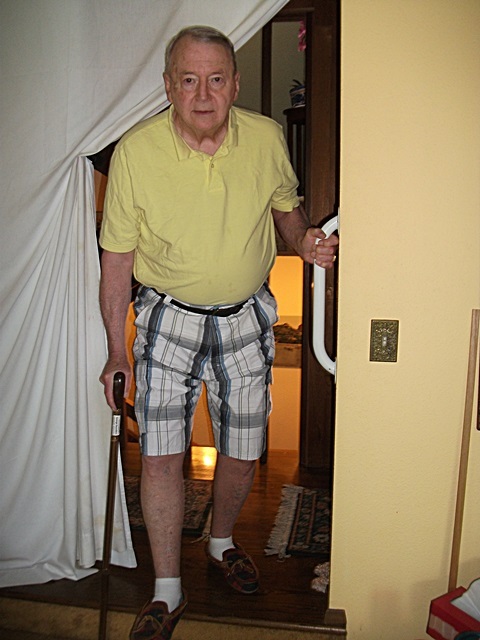 Its an easy tool…you put it around the mid section of the senior and then you can help guide him up and walk with him supporting his legs from the middle of his body. 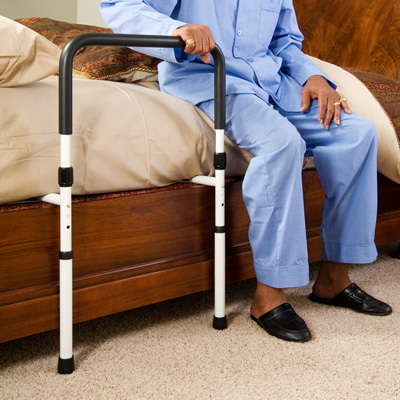 Or you can add a support bar for the side of your bed and the senior can use it to get up on their own. It will depend on if the senior has strong arms and is able to use them. That is why I keep George exercising three times a week. I have a routine I put him through to keep those legs strong enough for him to make transitions and get up and down from chairs and bed. As he goes up and down in his abilities…we stay with exercise. I use the elastic exercise bands to give him some pressure to stretch and keep his arms strong. Look for them at the sports department or ask the PT the next time you go. Thank you for all you are doing for your senior…you have no idea how kind and dear it is for you to give your time and love to another and let them age with grace. I have been giving George more and more of my time each day as his Parkinson’s is taking over…poor guy is losing his abilities so fast. So, what I try to do is take each day as a new day. If a day is bad…we work through it. But the next day we start a new…so if his strength is better he does more. If you start to put the senior into a pattern of you doing more and more for them and never checking if they can do some of those things on their own…its just a downhill slide for both of you. Enjoy the fall…no more hot hot days…things will cool down. George has already asked for Pumpkin pie or pumpkin cream in his coffee…so he gets what time of year it is. I also make sure I change the decor and the calendar in the house. Seniors have no daily change of pace…so pointing out the seasonal changes makes their days into days…not endless time with no change. Quality of care, depends on you as a care giver…so make fall a good time for you…and it will translate onto the senior you are caring for. Oh, would you please sign up for my blog listing. With the care giving getting more and more I try to do the blog, but often miss my weekly update. When you sign up for the blog it will notify you of the new post and you can keep on top of the info. Also…please, please share this blog. You have no idea how lonely care giving can be…and if I can help a few people along my own path of caregiving it helps me feel my own life has meaning…Thank you! 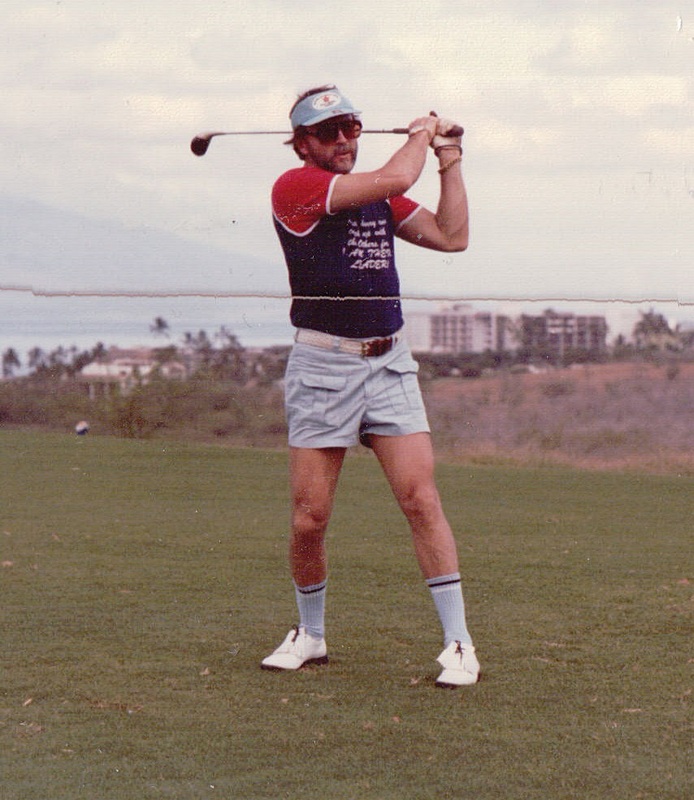 My dear Georgie was an avid golfer and skier. He ran, cycled and played tennis. Is there memory in those muscles still? 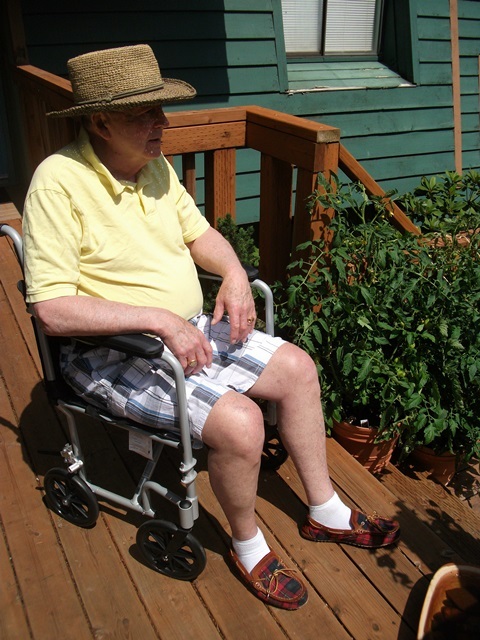 Alzheimer’s and Parkinson’s is robbing him of his mobility, how I am fighting to keep him moving. Dear Francy: Dad fell twice this week alone. He has a bruise on his upper thigh and his ribs are sore. I took him in to the doctor to check it out after the second fall, but this is so frightening. His Parkinson’s is just turning his legs into jelly. What can we do to keep him safe? I am right there with you. My Georgie is falling all the time and I worry so about a broken hip. How do you keep someone that is aging and losing their strength from taking tumbles? Well there are things you can do to lessen the problem. So, lets go through the list together and see what pertains to us and if we can use the ideas to keep our guys standing and walking safely. Start with clearing space. No matter where you live…look over the pattern that the senior is using to go to the bathroom, the kitchen, the bedroom and back to their favorite chair. Is there obstructions? Remove throw rugs, extra furniture and any clutter. Keep the area clean and clear…so the cane, walker or wheelchair is easy to use. If you have to re-arrange furniture so the senior is safer…do it. Life does not have to be pretty…it just has to work for the senior. Take note of the time of day that the senior takes their falls. If it’s at night they may need a better path to the bathroom or a portable commode. These commodes are easy to use and you tell the senior it’s just for night-time. Set it up right by the bed so there is only a couple of steps and then put in a good night light so the commode can be seen and used. When I had mom, I would use the commode by the bed at night and then take out the bucket, clean it and move the commode part over the toilet during the day. 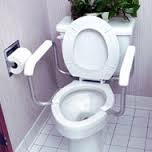 This provided handles for the senior to use when getting up and down off the toilet. “Table top walking” is a favorite with women. They do not want to break down and use that cane. So they move through their home by grabbing onto a chair back, a table top and counter. This is so dangerous and you simply have to draw a line and refuse to allow the senior to keep this habit. Get them a cane or a walker. The rule is a cane is for pain. Used for recovery from an operation, a break, or a arthritis type of continual pain. 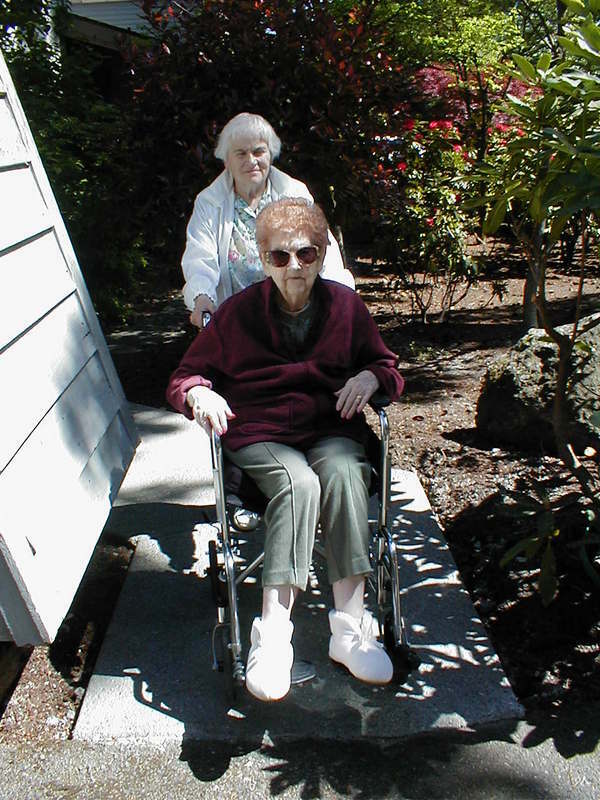 The walker is for steady and support-always get a walker with a seat, so the senior can rest if they feel weak. The wheelchair comes when the falls are simply so often that you can not depend on the senior to be safe alone. Physical Therapy should be ordered and they will review your senior and help them make the choice of what is right for them. If it is a walker or wheelchair, you will have to go through the living area and prepare space for the senior to move. Doors may have to be taken off hinges, kitchen areas cleared and a basket to carry food and drinks has to be added to the walker or wheelchair for convenience. Exercise. Physical Therapy can be the key to success to getting any senior walking stronger again. After stroke care, Parkinson’s, severe arthritis – it all has a lot of recovery to keep the body in movement and the PT will give special exercises to help the senior regain strength. I found it surprising that doing the exercises even three times a week made a big change for George. and each TIA took away her muscle abilities. I told her in order for her to remain with me, in my home…she simply had to be mobile. I could not lift or transfer her all day with my bad back. So she was such a trooper. Each time she lost her balance and could not walk…she would pull her self up and use her walker inch by inch. With me following her with the wheelchair in case her legs gave out. She recovered over and over again. I know; first hand…that muscles do have memory and you can recover it with patience and continued practice. But there is always a line in the sand when wheelchairs have to be used and transfer help from a care giver is the only way a weak body is able to keep safe. Eating to stay fit. Protein is really important to re-build your muscles. Add a protein drink to the senior’s morning exercise routine. It will help give them a boost. Go over their food and make sure they have plenty of small ziplocks filled with treats. Carrots, celery, peanut butter on crackers, a cookie, fruit slices etc. Keep them handy so the senior can munch and crunch every few hours. If they are living alone, you will call them for a short reminder for pills and snacks – four times a day…this will keep their energy up. Often seniors forget to eat and drink..they lose their energy and that reflects in their ability to safely walk. My trick is that they keep a cooler by their TV chair and it is filled each morning with drinks, food, treats and the senior then does not have to go anywhere for their daily food. This is perfect when a senior is checked in the morning and evening by a care giver or family member. Rules: setting rules is no joke. You set rules for children when they are growing…so you need to set rules for seniors. They may break them…but they need to know they are there. George is not allowed to walk without his cane or walker. I spend my day finding a cane in one room and bringing it back to him and keeping the walker close. But his dementia does not help him remember. So, its my job to keep his tools of support around him close, so he uses them. George can not overload his hands…I now transport anything he needs in a basket so he walks with hands free and balance in check. Medications can be a big problem with falls. Talk to the doctor about his falls and tell him they are worrying you. Ask if he can review the prescription list and see if any of the medications could make the senior dizzy, tired or forgetful. So when you are giving the senior their morning pills – you can adjust their routine to allow them to rest for a while after they take their meds. Make sure the senior is sleeping in their bed at night and resting their brain and body. Many elders sleep in their chairs and nap all day. This confuses the body and does not help the senior stay strong. Talk to your senior. Just sit down and tell them your concerns. “Dad, I want you to live with us. But if you fall and break your hip – you will have to have more care in a facility. This is why we are all trying to keep you safe. I know that the walker is not fun, I know you don’t like to be bothered with me hovering. But I am doing this to keep you safe and at home (or with us).” When seniors hear your concern, when they understand your fuss is in love – they take note of their own care. Life gets easier. I often ask George; “What do you think we can do to fix this?” And through his dementia he usually has a come back. Some times its funny…sometimes its way to hopeful…but he feels involved in the conversation. A senior’s personal honor has to be kept in place for them to work with you on solving problems. NO SHAME _ NO BLAME I work very hard to deal with emergencies, not yell about them. Even though I get mad and exasperated when my Georgie does something silly and causes a big issue of a fall. I take the moment new. I use a calming voice. i tell him to relax and just stay still till he can catch his breath. I inspect his body and make sure he is in one piece. I ask him about pain level. (1-10) I keep him still untill he can recover his mind and review his own body. When I feel it is safe I assist him in getting up again, using a straight chair. I bring the chair to the site of the fall. I get George turned around and on his hands and knees. Then he puts his hands on the straight chair’s seat and I assist him to slowly stand. If he is dead weight and not thinking straight – I do not try to move him alone. I call for help. I have a neighbor that comes over and if he did not respond to my call – I would call 911 and ask for assistance with a fall. The EMS (fire fighters) come and get him up and into a chair or bed. They check him out and would then help me transfer him to ER in my car or by ambulance if it was needed. I force myself to stay calm and thinking. After a fall: I have George drink water while he sits calmly in his chair. I turn off the TV and put on music to help him relax. I bring him something that has sugar, like a cookie and make him tea. I sit with him and we talk about something totally unrelated. That allows his mind to rest back into place. The shock of a fall is hard for anyone. Letting the senior absorb the shock and relax again…then rest for a while before they go to the bathroom (or back to their day activity) is best. I always cover George with a light throw when he is in his chair…keeping him warm, rested, fed and calmed with music and talk…brings life back to him. I save my fears and upset for another room…away from him. Often the fall worries me – more than George. So I try to calm myself down with a little tea and maybe a walk around the yard or a chat with a friend on the phone. It’s OK to cry out frustrations, but its not OK to do it in front of the senior. They will feel nothing but guilt over your upset. Pain. If the fall causes bruising or pain. Its best to make a call to the doctor’s office and ask to talk to the nurse. Tell her what you have done and what the senior complaints have been. They will tell you what to look for that would require the senior to come into the office. The rule I live by…is the ER and doctor’s office are there for real emergencies and I take that seriously. Just like a new mother…it takes experience to tell when a baby is in need of rest and love or a trip to the doctor. So it goes for seniors in care. Just the fact that you care about your dad and his falls..tells me that you are a kind person there to help your dad through his elder challenges. Dear Francy: I don’t know what to do…I am in trouble and too tired to make a decision. My husband has MS and he is still functioning on his own. He is in a wheelchair but he has a good life at home, as a writer. We have three children ages 10-15 years and they are in the swirl of life. I have been a part-time cook at the local cafe. My husband’s aunt is all alone in the world and very dear to us. We have a mother-in-law outbuilding in our backyard and we have fixed it up and moved the Auntie in, to be close to us. She is a quiet and kind person that was doing for herself but she needed a lot of our help. It all seemed great for the first three months she was here. Then she got the flu and complications and she became more frail. Now, I have to care for her…running back and forth over the path to what the kids call “the cottage”. I am getting so tired and the house is beginning to feel the pressures. I don’t know what to do. Our Aunt has done nothing to upset us…she is just getting older and needs more care. Do you think this is just a bump? Or is this going to spiral down and take more of my time? I can not tell you that, I am not a professional medical person. I am just a person that has years of giving in home care to my family and elders. So, what I will do is write down a list of things to help care givers with ‘in home care’ situations and you can pick and choose what might help you. Just remember there is no guilt when you try to give help and love to another…life changes and things often have to change. You are really in a situation that many others are…you are sandwiched in between job and family vs the care of a senior. Just the kindness of your heart, to make room for your beloved Aunt, is very dear to me. Thank you. YOU have to save yourself first! My dear friend Cheryl, was a flight attendant for 25 years and they were taught to be the first to grab the oxygen when it dropped down! So they could stay clear headed and help others. Its a lesson for all of us to remember when we face situations that require so much of us as care givers. START SMALL. If you just take time to sit with your spouse and go over the needs list for your aunt and decide who will do what. Do not forget your children, they are all old enough to do little things and be in charge of this or that. Maybe they will take over more of the “in your house or yard chores” so you can go and take care of your Auntie. Be honest…this time can be an amazing learning lesson for your children and you. Giving up some of your own wants and doing for others…is what characters are built on. But this organization meeting will show you how much time you are spending. I don’t want to be out of place saying this…but a business meeting is like a “Come to Jesus”. You finally see what is in front of you. ASKING FOR HELP: If your Auntie has money then you have to be honest with her and get her to allow you to hire help. It could be a cleaning lady for both places that allows you to forget the little things a bit. The one help I insist on is a bath lady. I have said this a million times. They are worth their weight in gold and they should be the first on a sparse budget. They will take that pressure away and get the bath and hair all clean in a ‘faster than light’ action. Plus, they are another friendly face for the senior. NO MONEY? Then you simply have to go down to the social services and get your Aunt signed up. They will do a review of her income and your care giving and they will provide help to make it easier for you. They will pay for her medications, they will provide food stamps for her food, they will pay – you – for care you are giving. (they do not pay for a spouse but they will pay for a family member or friend) Yes, in return they will make demands. You have to keep a clean area for the senior and do a few hours of nursing classes to teach you how to give healthy and wise care. But it was a life saver for me when mother’s care went into overdrive and I was not able to work any longer. BE HONEST: If you pretend life is fine, you are signing your own health decline order. This is not easy stuff…you simply have to say…I NEED REST. You can ask other family members to come one day a week, so you can ease your strain or simply sleep. You can ask your employer if you could just work two days instead of four days. Your income from the state should cover this change. You will find an increase in your expenses. Seniors require expensive food, protein drinks, Depends, extra electric bills with the increased clothes washing and heat bills. (seniors need heat all year round) Talk, the more you talk and ask for help…the more your family and community services will hear you and add you to their listing. COMMUNITY SERVICES AND FAITH BASED HELP: Even if you do not belong to a faith group, your local church, temple, etc is there for you. You are a part of their extended community and they will reach out to you. You may find that they have a list of retirees that are willing to come and just visit or sit with your senior so you can leave the house and shop. Or the senior can get a good laugh with a person of their own generation. You may find they have a food bank to help with extra items, they also have visiting lay-ministry people that will come and just talk with the senior. Do not get uppity about community help. Those services are made up of others that have gone through what you are going through and decided to put a group together to help others. Take advantage of their ideas and service time available. GATHER A HEALTH TEAM: Add your senior’s family doctor, get a specialist to at least see the elder once and review things. Get a nurse to talk to or just get a nurse practitioner to be your main care giver reference. Now lets talk real. Doctors diagnose they do not treat you. A nurse or care giver treats. So you need to learn how to ask the doctor questions and understand the chemistry of the elder’s health problems. The better your questions are, the easier the care giving will be. Then you need to know what will happen at home…and what that means you will be doing about the care. If you go through a bump, ask the doctor for in home nurse care, he can order that and the nurse will show you how to treat the elder. Bring in a nurse contact or help line to help you decide how to care for the elder at home and a pharmacist to explain the medications needed. The doctor will give you drugs and what is called an Rx for things like physical therapy, wheelchairs, in home help of an occupational therapist, message, therapy sessions, supplements etc. This is important; anything your senior needs should be written as a prescription so the insurance and medicare will accept it and help pay for it. Always ask the doctor to prescribe something and to give you generic medications so you are not going down a big hole when free services and medications are available to you. YES> THIS MEANS YOU NEED TO BE ORGANIZED. So don’t be a baby…the more you write down, the more questions you ask, the more you get clarified…the easier the care giving will be. Remember; talk to a nurse about home care tips…read my blog and learn home care tips. Use the Internet for extra advise and read it all…then make your own decisions. Talk about supplements that will help the elder and special ways to use food and exercise to increase the abilities of any senior in any stage of decline. Understand bowel movement difficulty, side effects of medications, dizziness, avoiding falls, eating difficulties, hydration challenges. All these things will come up so you need to write them down and have doctor or nurse show you how to treat the problems at home. It is not scary if you understand and are prepared. NO< NO< NO: I just do not want to clean a bottom, or smell blood, give a shot, or lift the elder up out of a chair. OK…see, that is being honest with who you are. It does not make you a bad person. You need to draw a line in the sand and when you come to that line the elder is going to be placed in a care facility. Everyone has a line, yours maybe closer than mine…but that does not make me a better person. I have a disposition to give care. I never knew I did…I was never a girl that said I wanted to be Nurse Francy. Now I know, that I can turn off my mind and just give the care without getting sick or too involved in the immediate yucky situation. Some can, some cannot. Know yourself and draw your line. I have a line. I drew it with my mother and now it is firmly in place with my husband and his decline with Alzheimer’s. They have to walk or at least be transferable. I have a very bad back and I simply can not lift a huge person and walk around without a great deal of pain. What is your line in the sand? 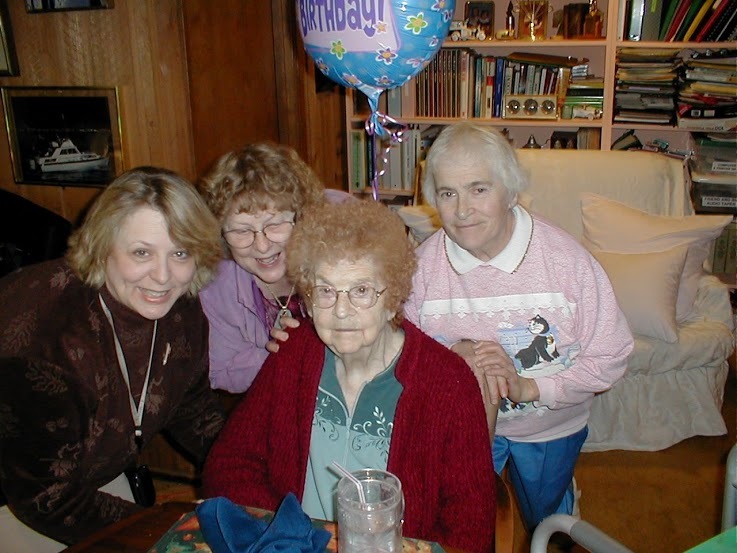 HAVE A PLAN: Is there respite services you can use or senior day care services? Ask and find out how the local community is prepared to help you with rest. There needs to be a plan, where would you take your elder if they need to leave you? Some where close so you can visit and keep an eye on their care. Have the place in your mind. Go and visit, tell them what you are doing and ask if they take medicare patients, if they have a long waiting list, if you could be on a secondary list of placement in case of emergency, etc. Once this is done, you will then be able to relax and know a quick transfer to a facility will not end up in you moving the senior again because the facility was not up to your standards of care. Call Hospice and ask them when you are to use their services…ask them how to judge the situation and they will walk you through a review of how to use them. So, if the senior is sinking down and wants to die at home…you can get help. Hospice also has facilities for end of life care…so find out the best way to use their services, now. Lastly, know what would happen if your elder passed in their sleep. Who do you call, is there money for a funeral, do they want a funeral. Do they want to be buried or cremated? Get it done early in the time you take the elder into your house. 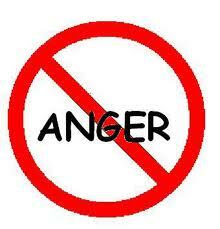 So as care accelerates you do not have to add another layer of upset to your own life. Get all this over and done. Then you can turn your attention to today…and making it a day of joy for you and your senior. You may think no one cares about you being tired, upset and stressed over senior care. You may think that no one has ever been where you are today…but you are wrong. Generations have faced the same problems and found solutions that worked for them. One step at a time…give it time. A senior may have a big dip…and then in a week or two they will regroup, re energize and come back up in strength and life will go on again. Give it all time. You take time to get over the flu…a senior takes more time. But encourage them to get well….keep them moving, drinking, eating and laughing. Let them know you want them to live…to the end of their life. Not just make it through to end. Keep your heart in the race and it will work out. Care giving is just a short part of your life time. The gift of your giving your heart…will come back to you in so many rich ways…year after year. NOTE: Will you sign up to receive notice of my blogs please? You will find the button on the right side of the screen towards the top. I do not write as often now that my Georgie is in need of more and more of my own time. But I am here to do all I can to help. So send me an email if you need help. f.
Seniors Love Reading WWII Books! Dear Francy: I have been friends with Kitty for a few years and have heard about her father’s photos. I was there while she was going through them one by one and trying to get the best out of the film. Film, from the WWII era…finally coming to life. To many of you that adore the war and all that it represents…you need to order this book! I ordered a copy for my Georgie on his birthday and he flipped over the ‘up close and personal’ views of the war photographed by an airman that was there on the ground and in the air! He loved it…it has been re-read over and over again. 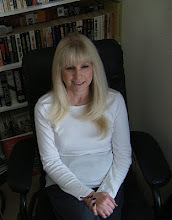 Kitty Kirwin has written many other novels and is a very talented person. I am very pleased she took time to be my guest writer. I am so pleased to present a lovely lady who writes from her heart. I know you will enjoy her work. How important it is for us as care givers to remember that the old memories are still in place in many of our elders. George’s Alzhiemer’s has taken his immediate memory away…but he still has his old memories of being a young boy during the war and following the war detail after detail. He used to mark a map, that he kept on the wall above his bed, as Europe was taken back by the ‘Good Guys’. The book brought back a lot of memories for him…I know you will enjoy it too! I am K. F. Kirwin and was recently asked to write about my latest book ‘My Dad’s Pictures From WWII’. Twelve years ago, Dad gave me twelve rolls of film strips. He had stored them poorly with rubber bands and paperclips, that had rusted! At the time, I was an art teacher and was teaching Photography so Dad thought I could do something with them. The filmstrips were in very bad shape. There should of been over 300 pictures but because the film was gun film, which was used in WWII, it crumbled as it was unrolled. After a lot of patience, I managed to save close to 200 pictures. I printed them all up for him and I asked who all the people were in the shots. He did not remember and with his eyes losing their ability to focus well– he could not see them close enough to identify the people or places. 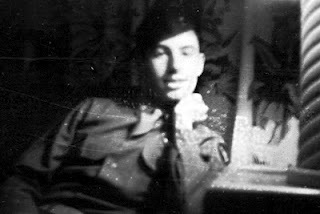 Dad was in the Army Air Corp and these pictures were from his time at the end of WWII. He was stationed at Orly, France. The pictures are of the airfield and Paris at the end of the war. After many hours of time sorting the pictures and picking the best ones I took them to the Pima Air Museum, in Tucson. They helped me identify many of the pictures. I decided to sort and gather the best and put them into a photo book of WWII. My Dad would have loved this book. Hope you do too! I wish I knew who the people were in the pictures maybe even know about their stories. My book ‘My Dad’s Pictures From WWII’ is in need of identification of many of the shots. Do you have an idea of who or where the photos were taken? I have an email address in the back for anyone who buys the book and knows someone. I will happily get them a copy of the picture so they can inspect it and enjoy. This year after a few very bad health issues, my son said; “Mum please put together that book of Grandpa’s photos.” He felt many of those that lived through the war or now, dive into the study of the details of World War II, would really enjoy seeing them. I would appreciate your purchase. I know there are many seniors out there that really get a kick out of mementoes from the war era. Francy has told me that George has a whole bookcase filled with WWII themed books…so I hope this one will hit the spot for you or your family members. Some of the profits on the book will go towards my son’s Grad school education… for his support of my time creating the book. Thank you, Francy. 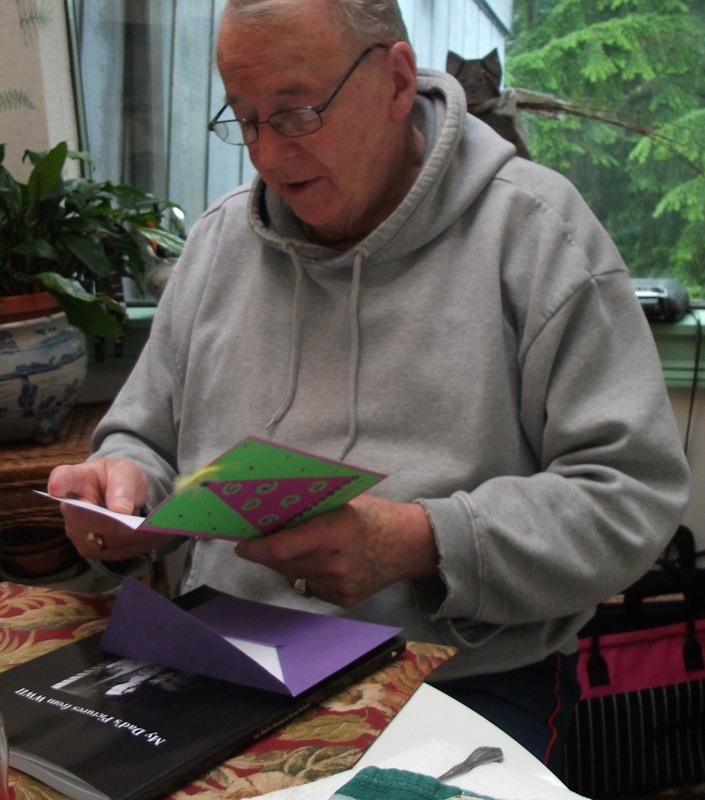 I so wish I had your blog to use the tips before my Dad passed away. I spoke to him in the last 20 hours before he passed. I am glad I could and this book is a tip of the hat to his life and his time of defending our country. Please come and visit my author site and enjoy all of my books. We just had a great surprise…a long time Twitter friend came to visit! George was up and happy and involved with meeting her and talking to her…but today – he is in bed. Does that sound familiar? I really wanted to share the Up’s n Down’s syndrome because so many of us have experienced it and it leaves us (as care givers) feeling like we see another person from others. When George has his family come to visit, he perks up and gives them his attention, love and laughter. They walk out the door and he takes a crash dive and I have to pick up the pieces. It has happened so many times that I have learned a few tips and I thought I would share them. You are not going to be able to help others understand that the person they chat with…is the best they can be. The senior is on a high in energy and is performing for them. The visitor sees that person and believes that is how they are on a full time basis. I have often gotten a little lecture about my comments on George’s condition; that they must be exagerated. That is always so hurtful to me. I want George to be well, to be happy and live a wonderful retirement. I want him to spend time out and about and enjoying his life with his friends and family. But no matter how much I want that for him, it will not happen. George, has Alzheimer’s that means that he has up’s and down’s and I am the one that has to try to keep him within boundaries so his life is as rich as it can be on a daily basis. As a lay-person, it has been explained to me that each of us lose bits of our working brain each day. If we are healthy those bits are replaced by the body. When a senior has Dementia the replacement of those bits becomes labored and then slows down like molasses. So, if George gets excited and uses up his energy and brain bits on a single event…it takes time for him to recover. He has to restore his body and brain energy and working parts. As the Alzheimer’s moves forward that replacement gets slower and slower and one day, will simply not happen. That means I have a job…to decide what is worth George having a high and then a few days low. Some times I simply have to say NO, to an event in order to keep him on an even keel. Here are some ideas to think about when you are making those decisions….should I take George to an event, or have so and so over to visit? Or, should I say NO, and be the bad guy. Thus, giving George a reprieve from a heavy low…that would take days to recover. Make sure you remove your own feelings in this decision. This is a hard one; as the spouse of a senior with dementia…my life is involved in each decision too. So I try hard to step back and make my care decisions for the best of George…not the ‘best of francy’. Has George been having a solid and calm month? Not, the last few days…but the month. Alzheimer’s has a flow and monthly is the smallest amount of time I use. Maybe he has had a month of falls, or bladder accidents and emotional upsets that have been higher than normal. If that is so, then extra visits, events, or celebrations are put on a low burner. Plan ahead. I have a 4th of July celebration coming up. It is extra important this year because we have lost one family member and gained another. Many of my family is going to be at this celebration and I want George to go. So I am already planning ahead. I am going to make sure he is exercised each day of June. That he does not miss any of his meds, and has plenty of sleep. I have decided on the day of the celebration I will take things to make sure he can have a mid-afternoon nap and will eat well, with extra sugar to give him energy. I am planning that far ahead…so he will go through the day with the least amount of stress as possible. If he gets extra tired…I will be ready to leave the event and go home. Events out. I have been surprised lately that George does not do well going out to dinner. He does well out at lunch. But dinner upsets him, he is bothered by all the people, the noise and thinks the food is bad…so why take him out? Because I want to keep his mind feeling that going out is ‘safe’ and normal. I have decided that I will only take him out to lunch from no on. The stress of after ‘4PM out the door’ is too much for him. I try to think up ‘out of home’ visits weekly – but make them calm and easy on George. If George goes out to my sister’s home and visits, he is fine. He knows the home, the people and he just sits and enjoys his time. It really gives him very little stress. If he goes to his son’s home with family, he is fine. But he goes there less often so the stress is higher. Now if he goes anywhere that he does not know the place, or many of the people are new to him – that is no longer good for him. Even though his life has been very social, he traveled a great deal and loves people— George is not his old self. I have to remember that and work around his fears and upsets…and make his life ‘safe’ as much as I’m able to do. Surprise is not a good thing for George. That is what I try to keep to minimum. If someone is in town and calls to come and say; HI. I ask them to wait a while, so I can approach George with the news and let it sink in. Let him get up and get dressed and not be too rushed. Let him know they are coming and I talk about it with a calm voice and up energy. I ask the visitor to come around 3ish…and to stay for an hour. It can be embarrassing to do this to people…but I have learned that it is worth my discomfort if George can have a nice short visit and still feel well the next day. The point of the above tips, is to show you how I am now just easing the way for George. I try to keep him in the loop of our daily lives. But I no longer share the heavy stuff. I don’t talk about bills, emergencies like my car needing repair, the chores around the house that need to be done, or the choice of what food to eat for dinner. Those ideas and thoughts would take George into a worry and maybe a depression. This is where the hard part starts. Because as a spouse, the sharing of daily life is what you do with your spouse. George and I will be married 30 years this September…we have been bestest friends and he had been a business professional. To leave him out of the loop of life’s pressure is totally foreign to me. But I have to ‘man’ up and know that life is now mine to oversee. It’s hard to explain to others, when they just want to stop by and take George out for coffee. Some times its a good thing, some times it’s simply is a NO. Don’t be afraid to be wrong, we all make decsions that turn out to be not the wisest in the book. But do get in the habit of thinking small daily issues through. Take your time; one day of not caring, could mean two weeks of you helping your spouse through a tough recovery. Days of no energy, confusion, anger, depression…that is a hard way to learn that thinking through your daily activity choices is important everyday. Keep Seniors Eating with Healthy, Easy Snacks! When you get older, and many times when you are on certain medications, you lose your taste buds. The taste of food no longer pulls you in…nor does the smell. So, the best thing to start is to really spice up the meal with low-salt herbal spice mixes like Mrs. Dash. My secret is to simply tell the senior they do not have to eat a meal…just snack. That might sound easy but it means you have to make sure that snacks are easy to grab and easy to chew and swallow. So, this is a little extra work on the family member that over-sees your mom’s care. Every 2-3 hours the senior needs to have a snack…a protein drink, a piece of cheese ( I love cheese sticks), a slice of good deli meat, veggies with dip, fruit with dip, a piece of chicken, a slice of steak, a baked potato. Keeping that energy level and blood sugar on an even keel is the true key to strength in mind and body. How can you help them with smaller eating all day long? Here are some tips to help them on their way. Chicken is so good….so you have all sorts of ways to serve it in small pieces. Bake or buy a roasted chicken and have it sitting in the fridge for snacks, or pre cut it into small pieces and have it in a zip lock…even easier. OR — buy the large family size chicken thighs and legs and put them into the oven – spice well, put BBQ sauce on a few and bake them all. After they bake and cool…divide them into small zip locks – freeze a few bags and keep a couple in the fridge for easy snacks. OK-Mok crackers are high in fiber, so are wheat thins – they’re best if you put them into a glass container on the counter – so the senior is tempted to grab a few when they walk by. Visual is so important…so make sure their cupboard is filled with containers not boxes. Buy see- through containers that will keep snacks fresh but let the senior see and grab easily. Do not pile on loads of food, best to do small amounts. If they live alone; buy a box of crackers, put 1/2 box in the container and take the rest home to your own family to enjoy. That way the crackers and snacks stay fresh for grandma and they change types often. Get soft cream cheese that is flavored with something they enjoy…the strawberry cream cheese is delish. I enjoy the salmon one myself. Good things are available in the dairy isle…take a look. They are pre making all sorts of things, including puddings. Remember buy small containers so they do not spoil so fast. Yogurt is great, but many elders do not like it. So introduce them to the Greek style yogurt that is richer and the new trend is putting loads of goodies into the yogurt. You will find it easy for the senior to have a small treat that tastes so rich. Veggies; many elders do not eat raw veggies. It was not popular when they were cooking or growing up. So, entice them with cutting veggies into small pieces and buy the tiny carrots and tomatoes. I buy a larger Rubbermaid container that has a green top. It’s a “fresh” container. If you get the larger one, you can fill it with a mix of little veggies that the senior can grab. It will stay fresh for a couple of weeks and then you can add a few different veggies to the mix. You gotta have “Ranch dip” for the veggies…and a secret? You can add in 2 scoops of vanilla protein mix folded into the ranch dressing. Each time they reach for it…they have more protein with each scoop. Watch the due dates on things and be prepared ‘throw away’ things. Try not to fuss over the waste…its better to have good food available for the senior than force them to eat left overs for days. Soup- I make my soups, cool and put a serving into a small ziplock. I then take it over to the senior. That way they get homemade split pea soup, German potato soup, chicken and broccoli soup– without buying a can and its the family recipe they probably cooked on their own for years. I freeze the soups and always write what it is on the ziplock in permanent ink. They can grab and go with soups in the freezer to the microwave or bag into the boiling water for heating. Steak is often not eaten by elders with problem teeth. So, I buy small steaks, I slice them into small long slices. I then marinate them for 3 days and put the juice and the steaks in smaller ziplock. This way they can fry the steak in just a few minutes and have thin small size to eat as a snack or dinner. (Easy Marinate:. 1 bottle of Italian dressing into a large ziplock and put in the steak pieces. Place it in the bottom of the cool meat drawer, in fridge and turn it over every day. ) Once again, transfer the meat once it has soaked for three days and put small amounts into ziplocks so Grandma can grab them easy and fry up with an egg for breakfast or a baked potato for dinner. 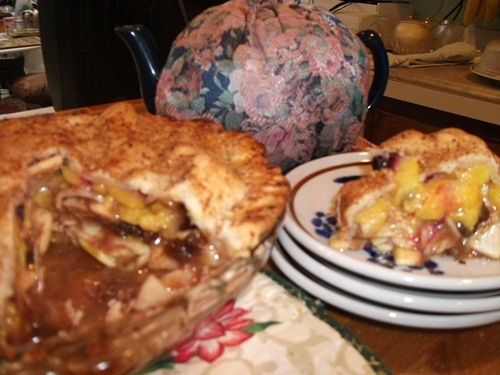 Apple sauce and apple butter…both great stuff to have handy. The apple sauce comes in flavors and is in single serve containers…how easy is that one? Apple butter makes a good yummy toast treat on top of a rich grain and nut bread. Old fashioned but yummy: Quick coffee cakes and small one egg cakes work great for seniors. Once again; you leave out a small about; 2 small pieces and then they can add ice cream and have a filling treat. You can buy them at the store and cut it…or make easy cakes on your own. I hope the ideas have helped you thinking in a different direction. For us eating is so easy, we can even do a drive through to get a quick burger. Seniors living alone and elders in care are limited to what is in the house and how easy is it to prepared and eat. That is the key…easy. Good luck, and thank you for all you do for the seniors in your family. Care giving can be a time-consuming and lonely time, thank you for your gift of love. Would you do me a favor and click the LIKE button and write a comment so I know how to give you some tips to help your life be a little easier…OH, and click the JOIN button and they will send you a notice when I have a new blog for you. *For all that want to know about George…he is due for this summer memory appointment. I will report back with how it went and what the doctor says about his medications. 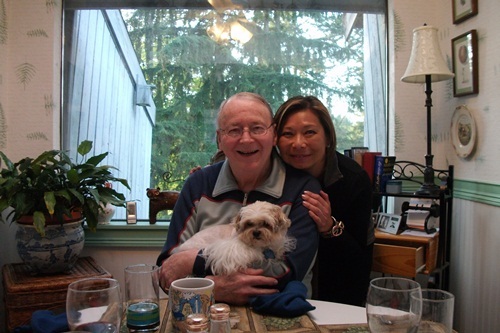 He is now on a cocktail of Alzheimer’s drugs…to boost his brain…Thank you for your prayers, I always feel them. f.
OK so some days the stress and anger simply hit the screen of life and I have had one of those lately! Then I added on a nasty fight with spring allergies. My eyes have been swollen shut most of the last two weeks. The itch and worry over my eyes has not made me a happy camper. I called Cheryl and told her help was on the way. All during this problem, my eyes are swollen and I can barely see the screen of the phone to make the calls. George is in the living room yelling at me and telling me how stupid I am and how I should listen to him and let him make the decisions. Bad language is flying in the living room and the people on the phone could certainly hear it. What to do? The stress building and building? No I was not OK…. I can not change my income at this point in my life…but I can still change my overall thinking process. George is to unwell with Alzheimer’s to correct his outbursts….but I can keep myself from jumping into his anger pool. I know that the job of a spouse to care for their loved one is a hard job. But I think the anger issue and the lack of the one being cared-for to appreciate the care that is given– is the hardest issue I have at this time. Yes, I often feel badly that I am angry at the way George reacts and his lack of appreciation…but NO, I can not change his frame of mind. I can only do things to give myself – my own feeling of appreciation. We may not be able to make life less stressful..but we can face the stress and work through it. I did not fix myself a drink, or take a sleeping pill. I knew that would be an unwise way to escape the pain. I wanted to face the pain and change it…not run from it. Because I am a strong woman that can calm myself down, think through my problems and ask friends to help me come up with answers. I wanted to share this Event with you…because I know if I’m having a hard time….so are you. Giving care to others is not an easy or fun thing to do. Pretending that spouses giving care is no big deal is a lie. Life hits and family members need to be cared for no matter what is going on in your daily life. I understand the pain you feel, the fear that takes over your heart and the uncertainty of your own future. Try hard to remember there are thousands of us going through this experience and there is a tomorrow, there will be a happier time ahead and you can catch moments of joy even on days filled with ‘Events’. Being honest and open with our friends, family and our own self…is the most important action we can take. Just hold on, because I am sending you all prayers of strength…we can do this,we really can and we will rise again to a life that is filled with memories of good times, not bad. Memories of giving our loved ones our love and our all….and knowing their lives were filled with our loving care all through their end of life journey.